Many people have trouble sleeping and blame it on anything from their lifestyle to the quality of their mattress. 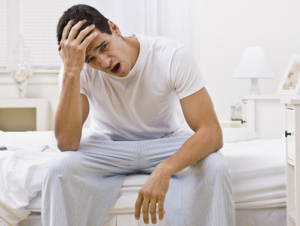 The truth is many people who suffer from poor sleep may be suffering from a sleep disorder and not realize it. People who have sleep apnea may not even realize that they aren’t sleeping well. Sleep apnea is a condition that causes a person to literally stop breathing while they sleep because of a blockage of their air passageways. The stoppage of breathing (apnea) happens quickly and breathing is quickly resumed, all while the person is in such a state of near sleep that they often do not realize what has happened. Sleep does stop along with breathing and in the morning a feeling of tiredness is usually present. A sleep apnea sufferer who is in bed for 8 hours a night is actually being robbed of much sleep. Snoring is one of the telltale signs of sleep apnea. The sound is made by air as it is trying to get past the tissue in the back of the throat that is blocking it. Sleep apnea is more common in middle aged people and those who are overweight. Men are more likely to suffer from sleep apnea than women., but some sleep apnea sufferers have no noticeable symptoms. If you know you snore and feel fatigued during the day even though you believe you get enough hours of sleep every night, you could have sleep apnea. According to the American Sleep Apnea Foundation and the National Sleep Foundation, sleep apnea affects about 18 million Americans, making it as common as Type 2 diabetes. Although sleep apnea is more common in men over 40, even children be impacted. The most common sleep apnea treatment is the use of a machine called CPAP that forces air into your mouth and nose. For some people a less cumbersome and more portable alternative treatment from a dentist can be an effective treatment option. Dental appliances are mouthpieces that are custom made to fit and gently keep the mouth and jaws positioned so that air can freely pass through the airway. Are your teeth behind your sleep disorder? The only way sleep apnea can be diagnosed is with a sleep study conducted by a sleep specialist. Today it is possible to undergo a sleep study at home. If you are diagnosed with sleep apnea you can seek treatment from a doctor or from a dentist. If you have trouble sleeping or feel tired when you wake up, have difficulty concentrating or feel fatigued during the day, or if you have already been diagnosed with sleep apnea, call your Chicago dentist to discuss how your teeth and jaw position could be related to your sleep problems.